Transportation means are drivers of urban development. Highways and interchanges induce low density sprawl, while rail stations can induce intense urban and economic development in their vicinity. But like everything else related to planning – urban space is not homogeneous – some places are more central with higher development potential and some less so. Potential assessment can therefore help and guide major planning decisions. This post is an explanation of a study we did on rail stations and which was presented at the last Space Syntax Symposium in Lisbon last summer. The full paper itself can be found here. At the time, we had to deal with the issue of Binyamina’s train station moving westward in the coming 10-15 years (one of Israel’s mid-size train stations) and this led us to ponder how can the development potential around rail stations be assessed. To tackle this issue, we synthesized Luca Bertolini’s qualitative studies with Bill Hillier’s quantitative studies. Bertolini has wrote extensively about the significance of train stations and the ways they should be planned to achieve goals such as efficient use of infrastructure and land development. Basically, he points out the fact that a train station is a place where large scale movement (train trips of ten and hundreds of kilometers) meet with small scale movements of pedestrians (movements of few hundred meters) at differing intensity levels. In addition, due to the physical characteristics of the trains themselves, the train stations are usually a barrier to pedestrian movement and cause interruptions in urban space. Therefore, planning a successful train station is a work of art with regards to entrances, exits and fitting in the surrounding space. There are stations where the centrality of the rail network combines with other factors which lead to extensive burden on the land in and out of the station (HaShalom station is a station like that in Israel, but Amsterdam central station and Koln central station show that such stations can be both very intensive and successful), while most stations have much lower intensities. Hillier focuses of analysis of spatial networks based on space syntax (a method in which we at PlaNet specializes at). Combining both approaches allows for some kind of standardization and quantification of Bertolini’s concepts in order to integrate these concepts in urban and transport planning. For the analysis of Israel train stations we have mapped the entire road network of Israel and its 54 train stations. In order to correlate the model we received from Israel Railways the number of average daily passengers for each station. We have found a satisfactory correlation at the 100 km scale, and we still have work to do with regards to edge stations (that get more passengers that what our model predicts). In the following map the model for assessing trains stations centrality (in the rail network) is shown with three categories – strong, medium and weak stations. Most of the train stations (70%) are weak, while a few (10%) are strong. Tel Aviv’s four stations are obviously strong, while Holon Junction is fifth, which points to a missed opportunity as most of the land around it is not developed at all. The most interesting stations are the medium stations (20%), since they have development potential that can materialize with good planning. The current Binyamina station is among those station and has neighboring employment center that got built against all odds. In order to combing rail movement with pedestrian movement we have employed two more computational steps. We have spread the rail strength index among all segments up to 700 m (pedestrian network distance) based on literature. Furthermore, we have employed a centrality index at 1,250 m radius to give a proxy for pedestrian movement intensity (based on correlated models for pedestrian movement in Israel). All these indices where multiplied together to create a single map which reflects train stations areas development potential. 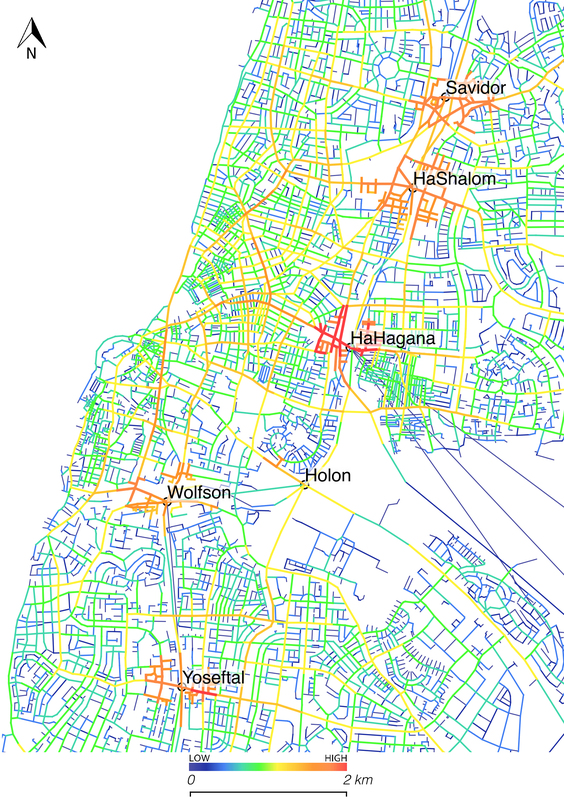 When analyzing Tel Aviv central area, it is found that the HaHagana station has the largest gap between its centrality potential and the built environment intensity around it. This is also the only station in Tel Aviv where there if free parking, which hints at the inefficient land exploitation. 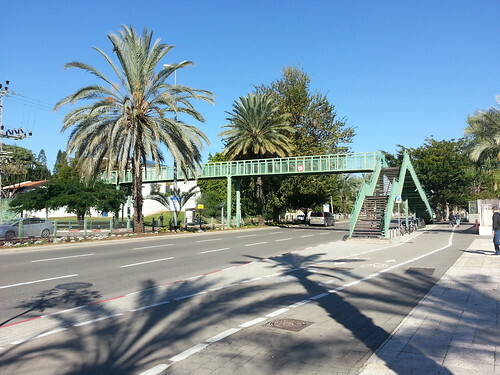 Another station with hidden potential is Yoseftal station which lies between Bat-Yam and Holon. Fortunately, Bat Yam municipality is making plans for intensification and we assume that Holon has something similar in its sleeve. The model presented here is a first step in creating quantitative methods for spatial potential assessment of train stations. In the next steps motorized movement and light rail can also be incorporated in order to keep improving the model. The use of such models would allow for identifying places with hidden potential – places where planning efforts would the deliver the most benefits. Such models can also be used when planning new train stations and when relocating existing stations to evaluate the optimal location. In conclusion, the study presented here is a first of its kind in the scope and analysis for train stations and I hope it will inspire further studies and would also have a real impact in planning. For those interested in delving deeper – the entire paper with all the explanations and reservations can be found here. During the past few months I’ve been getting heavily involved with my new planning consultancy called Planet. This initiative focuses on Spatial Potential Analysis (SPA) to support and improve decision making processes with regard to all aspects of urban planning such as transportation, land use and so forth. This work provides me a seat at the decision making forums. While there is great satisfaction in the actions we are carrying, we also help in changing the planing processes themselves. In line with our vision to steer the planning profession toward a more analytical and informed direction we also publish paper intended for the wider community in practice and academia. This past summer we have traveled to the bi-annual Space Syntax Symposium in Lisbon, where we presented two papers – the first focused on decision making processes using SPA and the second focused on rail planning (and I’ll discuss it in a future post). The paper which I will expand on here (and which can be downloaded here) deals with three different projects. The first project was for Dov Airfield quarter which is a mixed-use quarter planned on an airfield that is scheduled to shut down in two years and is located at the northern part of the city of Tel Aviv. In this project we analyzed the planned street network to identify the potential centers of the new quarter and focus and planning and design efforts on the street segment with potential for lively urban functions. The second projects deals with improving the center of Rishon Letzion – a large suburb of Tel Aviv metropolitan area with a somewhat deteriorated center. In this project we identified the specific street segments where improvements will carry the most benefits for the city. The last project dealt with assessing regional roads on the northern fringe of Tel Aviv metropolitan area. Our work in these projects show that SPA can help planning teams focus on the dynamics of the street network and the ways in which this network has an impact on transport planning and land use formation. I am confident that this field of practice will grow and help make urban planning better. In the picture below – part of the work done for Dov Airfield in order to identify the street segments and intersections with the highest urban potential. As mentioned before, the entire paper with all the explanations can be found here. A guest post by Ray McNeal. In the coming years, the urban population is expected to increase by over 274,000 people every day, and cities across the world need to work diligently to adopt a more sustainable layout capable of supporting this urban growth. Together, urban planners and developers are working to sustain an ever-growing population on limited resources. Take for example Stockholm and New York City which face similar growth and resource predicaments. Järva, a modernist extension of Stockholm is trying to build a sustainable city to support a growing population, as part of the city’s efforts to regenerate the city’s housing market. Järva is working towards a fifty-percent reduction in energy consumption. “It’s never enough to create a technically ideal structure if it doesn’t meet aesthetic, creative and social needs,” says Swiss architect Bob Gysin. Järva, with its own wind turbine, solar cells and panels attached to the facades and roofs of buildings, and innovative insulation methods is providing not only an answer to updating decades-old buildings, but also improving the sustainability of the city overall. New York City is currently in the midst of and affordable housing crisis, and real estate developers have increased the production of housing units by 22 percent in some areas. Upcoming NYC development projects must meet housing needs, while also minimizing the negative impact on the environment. One real estate developer Rob Speyer, of Tishman Speyer, has addressed some of these concerns at a recent Urban Land Institute conference. Speyer discussed the need to take a holistic approach to real estate development that considers how the surrounding space impacts the environment, in addition to the building design itself. Speyer compared a dated NYC apartment complex to a LEED certified house in the desert – asking conference attendees to consider which development is more sustainable. While the desert residence may seem like the obvious answer, Speyer explained how the isolated desert home required its owners to drive long distances to connect with other people and services. The apartment complex, on the other hand, situated in close proximity to necessary amenities, removes the need for residents to have a car, reducing harmful emissions. Urban planners are currently faced with an immense challenge to support a population growing at a faster rate than ever, while simultaneously minimizing the impact on the environment. To be successful, planners must take a holistic approach, including “green” energy features within new developments while also considering how the development will be able to connect with the surrounding environment. Ray McNeal spent the majority of his career in the real estate industry. Throughout his career, he became fascinated with the concept of sustainable development. He is currently a blogger whose focus is the benefits of sustainable development in today’s cities. Freiburg, a small city in Germany has become one of the role models for sustainable urban development in affluent regions. Freiburg is located in a prosperous region in Germany (the state of Baden-Wurrtemberg) a nation known for its automobile production and use. Even so, during the last 50 years Freiburg has taken a myriad of urban planning and policy steps resulting in a rather low car ownership and low car dependence. Last year, I was on a tour in Germany where we also visited Freiburg and its celebrated new sustainable quarter called Vauban. This area was an abandoned French military camp, which was reused and turned into a very low car mixed-use residential quarter. The place was re-built using strong platform of cooperation between residents and the city government incorporating all kinds of sustainable solutions including integrated land-use and transportation planning. Freiburg’s light-rail was extended to the Vauban quarter, while parking was heavily restricted. Besides the overall urban plan, Vauban includes many unique sustainable experiments such as the solar settlement consisting of 59 units which produce more energy then they consume, employing solar panels (surprise!). After long negotiations, Vauban was granted a waiver for minimum parking requirements provided that enough green space was preserved for potential future construction of parking lots. Building permits in Vauban are issued for residential units without parking spots. Residents who decide to own a car can purchase a parking spot in one of the parking garages at the edge of the development for the equivalent of $25,000. Residents who wish to live car-free simply pay a one-time fee of $5,000 to preserve open space at the edge of the development— in lieu of a parking spot. plant just 30km from Freiburg’s old town made environmental protection a critical issue (Hopwood 2007). Protests against the state government’s plan to build the nuclear power plant lasted for years and forged an unlikely alliance of leftist students, Catholic and Protestant church leaders, the conservative party, and local farmers. Highly respected civic leaders were at the center of the local opposition to the state government’s plan. Their role in the protests legitimized environmental protection and alternative development ideas for the local population (Chaney 2008;Hopwood 2007).Over the last 40 years Freiburg has developed a strong tradition of cooperation, negotiation, and consensus among city administration, citizen groups, and local businesses (Bratzel 1999). Public discourse, citizen participation, and cooperation paved the way for a gradual change towards sustainability in Freiburg (Bratzel 1999). Implement controversial policies in stages. Plans should be flexible and adaptable over time to changing conditions. Policies must be multi-modal and include both incentives and disincentives. Fully integrate transport and land-use planning. Citizen involvement must be an integral part of policy development and implementation. Support From higher levels of government is crucial to making local policies work. Sustainable transport policies must be long term, with policies sustained over time, for lasting impact. It should be noted that Freiburg does not have a transportation planning division, but an integrated urban planning department that combines transportation and land-use planning. This is probably the easiest recommendation to implement (number 4 above) – abolish municipal transportation departments and merge them inside land-use planning. The city keeps growing at a modest pace and is currently planning a new quarter for 10,000 people which will probably rise to new fame when its built. You can read the full paper on Freiburg’s sustainable urban development here. Following the previous post which discussed actual observed pedestrian movement and commercial streets in Tel Aviv, we now turn to the major theoretical contribution we made in our last paper regarding the connection between the built environment and pedestrian movement. A spatial dimension. This dimension is related to the structure of the road network, meaning the basic urban space mainly consisting of streets and squares. This dimension of the built environment is relatively stable and does not change. Various studies have already shown the importance of the street network configuration to pedestrian movement as well as other urban dynamics. A functional dimension. This dimension relates to land use and we included in it the distribution of retail fronts and proximity to public transit. A physical dimension. 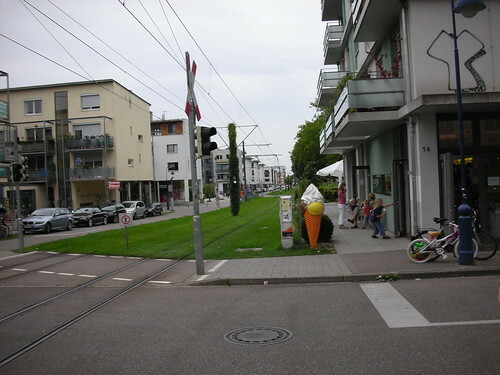 This dimension is related to actual street sections, meaning the width of the sidewalk and carriageway, which determines how easily a pedestrian can cross a street. A demographic dimension. This dimension is related to residential and employment densities. While conducting this study I have spent numerous hours doing field surveys to map all kinds of missing data. Specifically, retail fronts locations as well as road and pavement widths are not easy to come by. As the age of Big and Open Data is fast approaching I hope that more types of data will be collected on a regular basis, leaving us with more time for analysis. After we have collected all the quantitative data we ran endless statistical correlations to better understand how the built environment and movement are tied together. The conclusions below are derived from the statistical connections we found. Our study draws heavily on space syntax theory, which emphasizes the dominance of the street network structure on various urban dynamics. One of the best known papers in this field deals with the connection between urban space and pedesrtian movement. 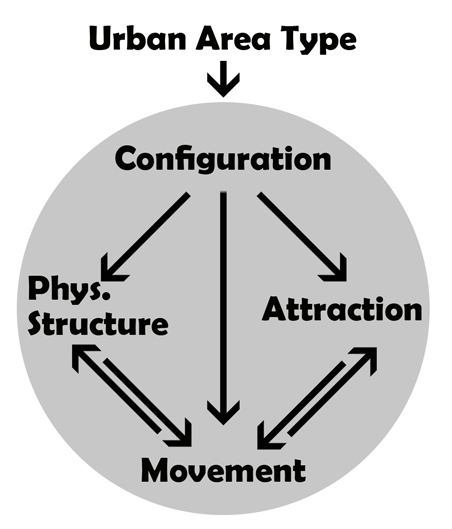 This paper from 1993, written by Bill Hillier and others describes the natural movement of people in urban space and connects movement, land use and street network structure. Our findings are in line with Hillier’s diagram. Our theoretical contribution is an extension of Hillier’s diagram to include the physical dimension and add the urban area type (traditional vs.contemporary) as the basis of the generation of urban space itself. The physical dimension was found to be impacted by the configuration and to have an impact on movement (similar to the functional dimension). 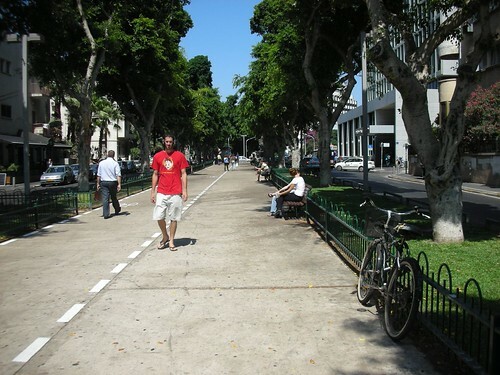 Essentially, sidewalk width may change due to people movement and in turn change the movement pattern. In the diagram below you can see Hillier’s original triangle to the right and at the the top is the urban area type which impacts all the urban environment dimensions. The next post will deal with specific finding and the struggle to find the best movement model for every city. Essentially, this study aims to examine what conditions lead to greater pedestrian movement in urban space. To achieve this goal we have quantified various attributes of the built environment and then checked their statistical association with the level of observed pedestrian movement. The research was carried in four different areas in the city of Tel Aviv. Each of those areas was split into a traditional urban area and a contemporary one, reflecting the major shift that occurred during the 20th century in urban planning from a humanistic discipline to a technocratic one. In this sense Tel Aviv is an ideal case for such an investigation containing both contemporary and traditional urban areas in close proximity. The first area (marked with the number) is centered on Ibn Gabirol Street, which is one of the major commercial streets in the city. The second area comprises of Florentine Neighborhood. In these areas both the traditional and contemporary parts were planned, yet they differ significantly in the connectivity levels and in land use composition. In both cases the contemporary area is a super-grid of the older traditional area next to it. In addition, Florentine’s contemporary area was planned as an industrial area and as a result have a rather low residential density. 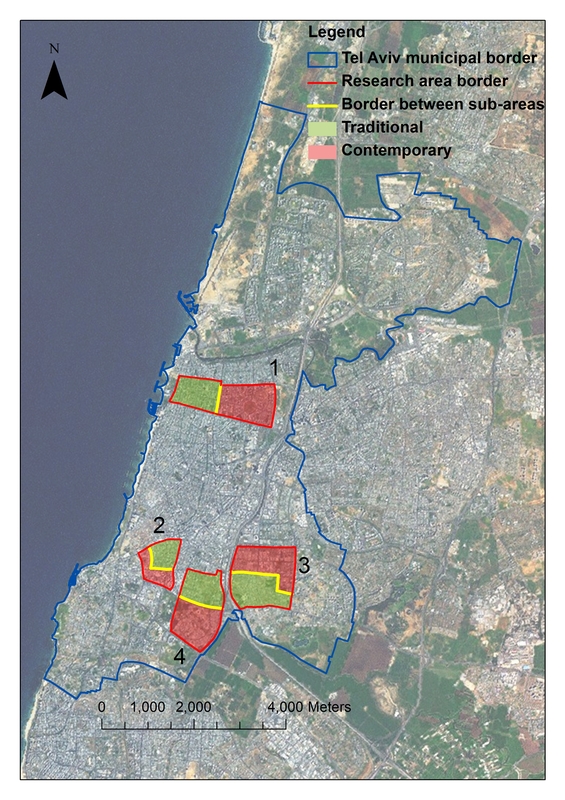 The third area comprises of the neighborhoods of Hatikvah (traditional) and Yad Eliyahu (contemporary), while the fourth area is made of the neighborhoods of Shapira (traditional) and Kiriyat Shalom (contemporary). In both of these case the traditional neighborhoods were unplanned in some sense and had a bottom-up process of generation. In contrast, both of their contemporary counterparts were planned from the top in the fashion of early modernistic planning after the second world war. The following map shows our findings regarding observed pedestrian movement volume and retail fronts distribution in all of the research areas. The pedestrian movement volume is distributed in a heavy-tailed way, meaning that there are only a few streets that carry a lot of movement while most of the streets carry low movement volumes. To visualize this we have emphasized the points where the top 10% of pedestrian movement was observed with red points and the next 20% are highlighted using orange points. In this context, heavy pedestrian movement means over 400 pedestrian per hour and medium movement rate means stands for over 200 pedestrians per hour. As for retail distribution – streets sections in which both sides have retail are marked with red lines, while streets with only one side of retails are marked with orange lines. Basically, the traditional areas have a more connected street network, with a higher presence of retail fronts and a higher volume of pedestrian movement. Moreover, even in the traditional sub-area where the lowest pedestrian movement volume was observed (which is Shapira Neighborhood in the top of area number 4), the average movement volume per road segment was higher still than that in the contemporary sub-area with the highest pedestrian movement volume (which is the eastern Ibn Gabirol area – to the right of area number 1). Pedestrian movement is higher in that traditional area even though the residential and employment densities are lower than that of the contemporary sub-area. It can be clearly seen that in all traditional urban area commercial streets have successfully developed, while in the contemporary urban areas no commercial streets managed to grow. This happened regardless of municipal regulations that sometimes tries to prohibit commercial development and at other times tries to promote it. The commercial streets have all developed along the most central streets. Over the fine grid of Florentine (top-right in area number 2) an extensive grid of commercials street had sprouted from the top-right intersection, which is a rather central intersection in the city of Tel Aviv. “The effects of block size and form in North American and Australian city centres” by Arnis Siskna. This paper examines 12 CBDs of North-American and Australian cities and reaches findings on land use formation based on the street network and morphological structure. Siskna points to the spontaneous development of urban commerce in the shape of a spiky potato. Another and better known paper extends Siskna’s findings: “Centrality as a process: accounting for attraction inequalities in deformed grids” by Bill Hillier. In this paper Hillier suggests several insights regarding the development of intense urban centers and the needed conditions for them. And as previously mentioned, you can find my new paper which further confirms and extends on Hillier’s work here. A big report titled “Making the Case for Designing Active Cities” was published a few months ago by the Active Living Research Unit at the University of California in San Diego. This report synthesizes over 400 papers based on five physical planning subjects: Parks; Urban Design and Land Use; Transportation; Schools; and Buildings. These five planning subjects and the papers relating to them are then evaluated to assess the co-benefits of activity-friendly design on six societal issues: Physical Health; Mental Health; Social Benefits; Safety; Environmental Sustainability; and Economics. Town or spatial planning as it is more accurately called has at its heart the attempt to manage those very same determinants of health – employment, housing, transport, education and environment. You might therefore expect it to be at the forefront of the challenge to improve health and wellbeing in our urbanising world, but this is not the case. There is strong evidence that there is a very poor level of mutual understanding and weak integration between planning and health professionals and their interventions. Health officials in planning committees generally are busy with issues relating to industrial pollution and water treatment at best. Their spatial planning understanding is usually weak. In contrast, the urban planners tend to focus on the number of parking spots and housing units under consideration (sometimes the planning discussion only involves parking spots), and are oblivious to the general health and lifestyle outcomes their planning promotes or prevents. An important barrier to environmental changes that support physical activity is that decision-makers do not consider physical activity an important enough rationale to justify policy changes and investments. Even if a decision-maker is well aware of the important effects of physical activity on health and health care costs, health may not be on the agenda of the decision-maker. Decisions taken in the transportation, city planning, parks and recreation, education, architecture, and business fields often determine whether environments facilitate, or create barriers to, physical activity. Health is often not part of the mission of these groups. Though mayors, city councilors, and similar officials work everyday to balance competing interests, most of them do not understand that environments that support physical activity produce additional benefits for their communities. Thus, creating activity-friendly environments can be a solution that solves multiple problems. This situations was evident at a recent three day workshop on planning for activity and public health at the University of Haifa. The participants were mainly from the health-related fields while the planners, geographers and traffic engineers were missing. This reflects the fact that planning related health issues are completely missing from the table. Changing policies about built environments is usually a politically difficult process, opposed by vested interests and vocal citizens. Evidence of the benefits of change may not be sufficient to overcome voices of negativity. Fortunately, we can expect many powerful voices to speak in favor of creating activity-friendly environments. Real estate developers can make more profits. Homeowners will likely see their properties appreciate. Retailers can expect more business. Most importantly, the majority of people, at least in the US, support more walkable communities, more walking and bicycling facilities, and more and better parks and recreation facilities. People want to live in walkable communities but cannot because zoning laws in the US favor single-use, automobile-dependent developments. Though there is opposition to every proposal, support for activity-friendly environments appears to be widespread and growing. I hope that in the not too distant future, alongside the changes to the outdated traffic engineer profession, the new urban planners will also bear in mind the health outcomes of their designs and our public health officials will learn a bit on how urban planning affects their jobs. As evident from the name of the paper, this publication deals with the impact of planning on pedestrian movement. 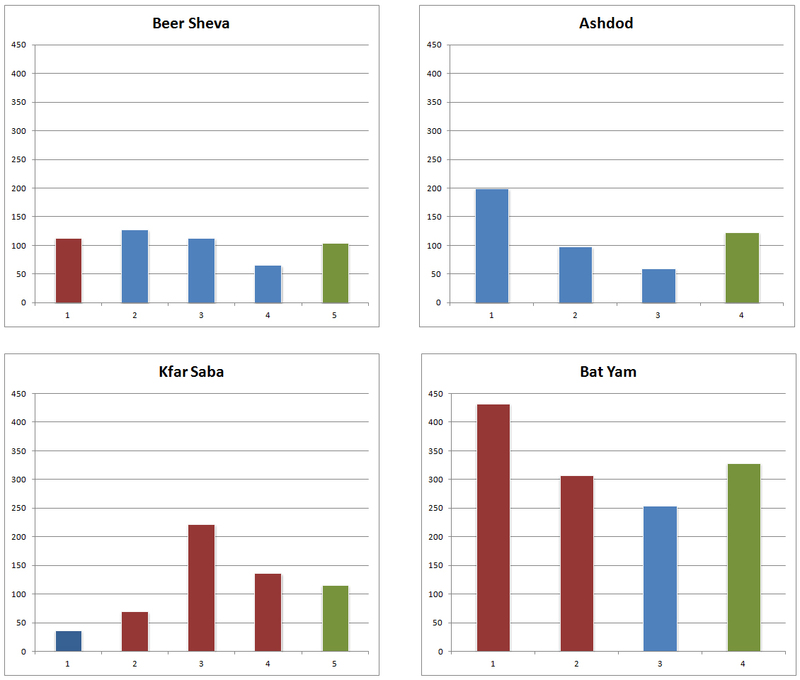 We analysed pedestrian movement in 14 neighborhoods in four different cities in Israel – Kfar Saba, Bat Yam, Ashdod and Beer Sheva. These neighborhood where divided to two categories – modern and pre-modern. Essentially, modern neighborhood are those that were planned along modernistic urban planning approach, which adheres to separation of uses and hierarchical road structure. In contrast, pre-modern planning which tends to be denser with a lot more mix of uses and less hierarchical road structure. Basically, all the neighborhoods planned after the establishment of the state of Israel (1948) are modern, while most of the neighborhoods that were established prior to the Israeli state independence are pre-modern. Moreover, the cities of Bat Yam and Kfar Saba have many more pre-modern parts than the cities of Beer Sheva and Ashdod (this city was established in 1956 and consist only of modern planning). 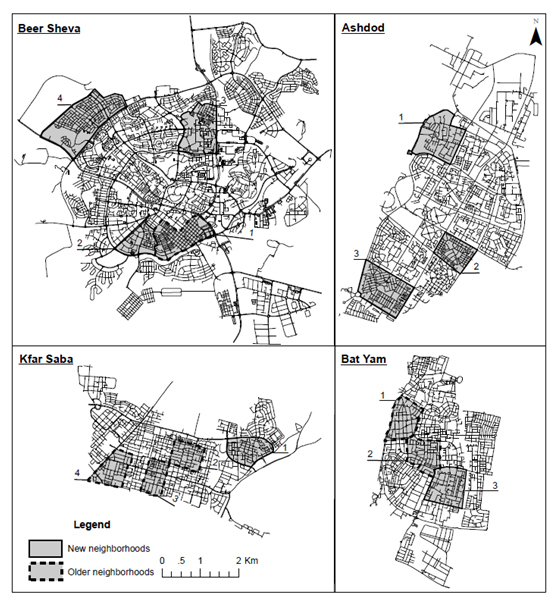 Following are the maps of all the research neighborhoods in their respective cities. Dashed lines mark pre-modern neighborhoods while continuous lines mark modern neighborhoods. We did pedestrian movement surveys in all the research neighborhoods and examined the statistical correlations of the movement volume with relevant quantifiable variables that describe the built environment. For the analysis of the road structure we have relied heavily on space syntax. Other variables were derived from land use distribution – especially retail and demographic variables such as population densities. Significant disparities in pedestrian movement volume were found among the cities and among the different neighborhoods. The pre-modern neighborhoods had about twice the pedestrian movement volume of the modern neighborhoods on average. Also, retail fronts were found to be much more prevalent in pre-modern neighborhoods than in modern neighborhoods. The chart below shows the average pedestrian movement volume (per hour) observed in the surveyed road section in all research neighborhoods. In red are the pre-modern neighborhoods, blue signifies the modern neighborhoods and green represents the average for each city. The city of Bat Yam, which is one of the denseset municipalities in Israel has remarkably higher movement volume than the other three cities. Average pedestrian movement volume per hour in the surveyed road section in all research neighborhoods. Red is for pre-modern neighborhoods, blue for modern neighborhoods and green for entire city average. Furthermore, our extensive statistical correlations showed that movement in pre-modern neighborhoods is far more predictable than in modern neighborhoods. At the last phase of this study we tried to produce a generic movement model for each type of neighborhood. 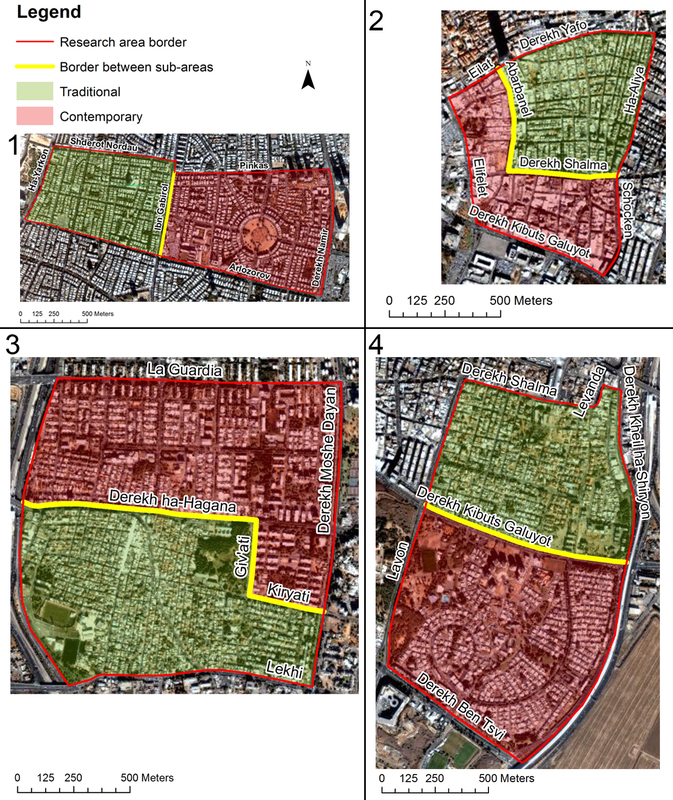 To validate this model we analysed pedestrian movement in four more neighborhoods in Kfar Saba and in another city called Hod Hasharon (one neighborhood of each type in each city). The model had far more success in the pre-modern neighborhood than in the modern ones. Our study shows that traditional pre-modern urban neighborhoods, with a well-connected street structure, are likely to have not only more walking within them but also a more predictable spatial distribution of pedestrian volume than modern neighborhoods, that are characterized by hierarchical tree-like street layout associated with the idea of the neighborhood unit. 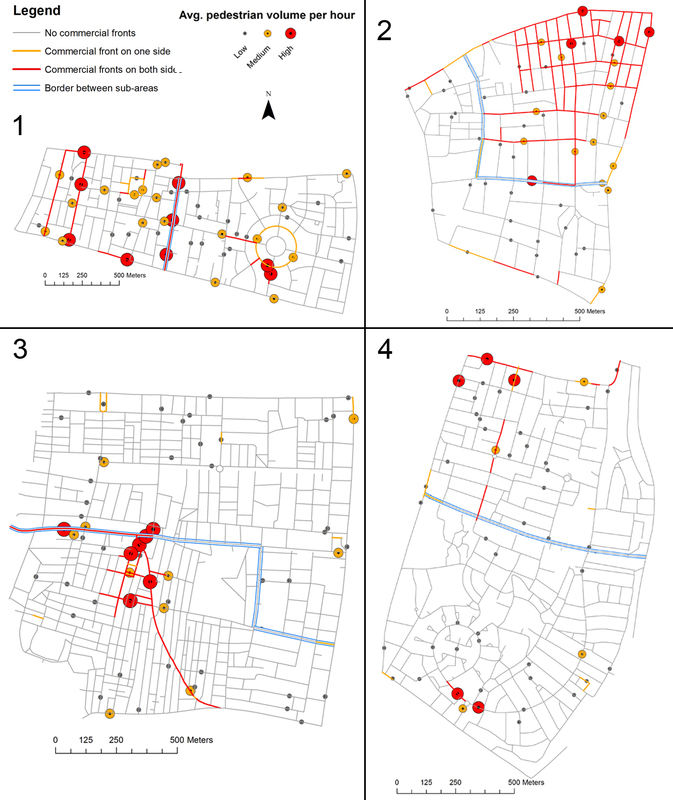 We have identified that the correlation of pedestrian volume with the street network’s configuration attributes are significantly higher in pre-modern urban neighborhoods than in the modern neighborhoods. Furthermore, our study revealed that the distribution of pedestrian volume in these neighborhood types interacts differentially with the street network. In modern street layouts, the different types of configuration attributes (topological, angular, and metric) tend to be much more varied in their correlation with pedestrian volume across scale. The full paper provides all the results and findings, expands on the use of space syntax in this research and describe in detail the statistical methods employed. You can find the full paper here, and if you cannot access the full paper and would like to read it you can contact me here and I’ll send you a copy. Criticism of modernistic urban planning and its failures tends to epitomize Le Corbusier as the main culprit behind the change in planning approach during the 20th century. Some may suggest that without Corbusier our urban planning would remain humanistic and rational like at has been during most of human history. While Corbusier definitely deserves an honorary place among the people who destroyed the profession of urban planning and created inhuman habitats, he was far from being alone, and was working in the zeitgeist of his time when many other planners envisaged a slew of anti-urban plans. One of the modernistic concepts which is (unfortunately) still very much alive is the Neighborhood Unit. This concept was summarized by Clarence Perry in 1929 for New York Regional Survey and is the main subject of this post. 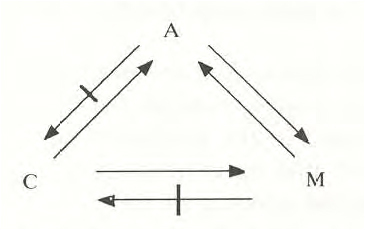 Below is the most recognized diagram that is associated with Perry’s work. You may note that Perry surrounded his ideal neighborhood with highways and on further inspection you may also note that he avoided making any direct links from one neighborhood street to another neighborhood across the highway, thus making sure its neighborhood remains in its own limited world. Neighborhood Unit Diagram. “New York Regional Survey, Vol 7” by Source. Licensed under Fair use via Wikipedia. Perry advocated for planning of an autonomous unit centered around an elementary school with just a little bit of everyday needs in it. When reading his seminal text a few points pop up, that are unfortunately still very prevalent in current planning practices almost a hundred years later. For one, Perry’s meticulous analysis the elementary school (from page 46) carefully examines the number of children in an average household and goes on to use this demographic information as if it was written in stone. Well, as it happens average households in New York today are quite different than they were a hundred years ago (they are much smaller with much fewer families having three children or more) and will probably be very different in another hundred years. The same goes for his analysis of shopping needs (from page 76) which again assumes that society is static. Perry goes into enormous details on the specific shops that are needed inside a neighborhood unit (including a millinery, which is a fancy word for a hat making shop) versus those that should only be found downtown. The basic assumption is that everything is static – demographics (family size) do not change and society needs at large do not change (schools, churches and so forth). Furthermore, as far as urban development goes, Perry assumes that in the future everything of importance will be concentrated in the downtown and no significant urban changes will occur in terms of metropolitan development and land use dispersal. To some degree, assumptions of an unchanging future are the backbone of all modernistic urban planning. After analyzing people’s needs Perry proceeds towards the street network he thought would liberate people. The text embraces full automobility as inevitable and predicts that in the future everyone will have an automobile and every trip outside of the neighborhood unit will be done by one. 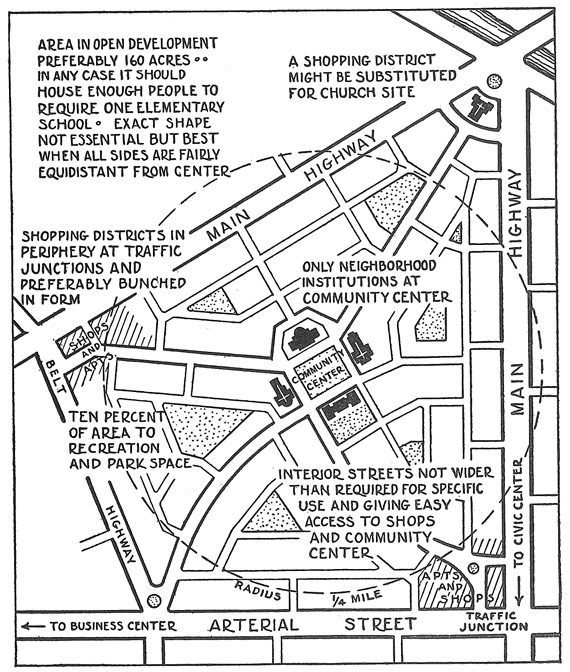 It assumes only two kinds of streets – local streets and fast highways. There is no place for main streets (major commercial streets) in Perry’s world. Against this unrealistic background Perry tried to address pedestrian needs and made his neighborhoods completely disconnected from each other and from the city that they were added to. 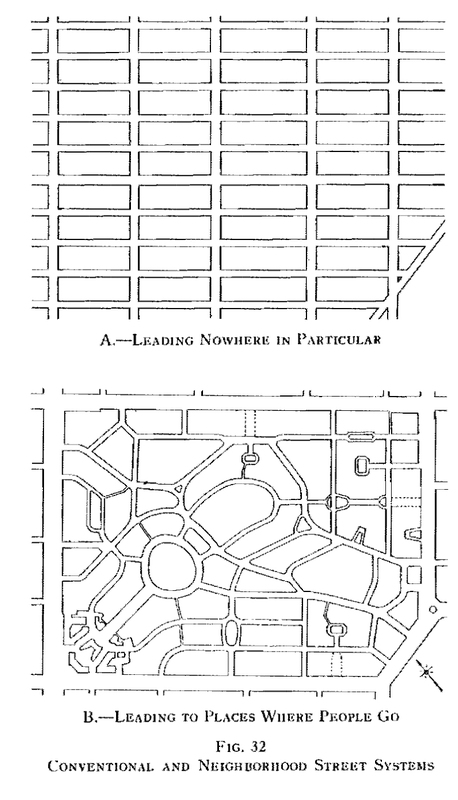 The diagram below shows how Perry viewed the classic American open-ended grid that is at the base of all the decent urbanism that still remains in the US. In his view the grid led to nowhere in particular, while his closed street scheme leads to “place where people want to go”. In practice the grid leads to a myriad of destinations open to change and growth, while a closed and disconnected street network leads to a place that’s quite resistible to change. By not centering neighborhoods on arterials, the Perry model and its variants create a fragmented transit service area that cannot be serviced cost-effectively. According to such critics, this failure has a significant impact on the viability of a public transit system, and on the resulting ability to reduce carbon emissions from urban transportation. In contrast to the dysfunctional Neighborhood Unit a few examples of real city development with emphasis on well connected urban fabric are given: London, Barcelona and my personal favorite – Portland, Oregon. Perry’s Neighborhood Unit concept did not wreak havoc only in the USA, but spread across the globe. Israel, which was established during the modernistic golden age (1948) embraced the Neighborhood Unit concept with zeal and now has many municipalities made only of Neighborhood units with no real city parts whatsoever. One example for such a place is the port city of Ashdod (established 1956) which consists of a large port and industrial area to its north and 17 Neighborhood Units to the south. The city has about 250,000 people in it, but instead of utilizing this congregation of people it is actually made up of 17 villages of 10,000-20,000 people, each with its own slowly decaying low-level commerce. Below is Ashdod’s map with its disconnected neighborhoods. Ashdod is now trying to take one of its arterial roads and turn it into a real urban street, connecting its disjointed neighborhoods (you can read more about it here) with an ambitious plan that tackles street network changes, land use changes, commercial development and public transit. Whether such a change is feasible is open to debate. In conclusion, planners need to be aware of the Neighborhood Unit’s major shortcomings and should resist the urge to plan a closed and segregated ideal and never-changing urban habitats. After all, those places may be much worse than open-ended places that are open to change. Tel Aviv, the financial center of Israel, is notoriously known for its housing shortage and rapidly rising prices (some of it due to the incompetent Israel planning regime). On more than one occasion it seems as if the regulations have been put in place to insure chronic housing shortage. Building anything next to something else is almost impossible, while creating new cheap apartments in centrally located areas belongs to the realm of science fiction. This shows Israeli planning at its current worst and resembles many situations in places that are not as backward as Tel Aviv. The main priority of planning committees in Israel lies in providing cheap accommodation for cars, while every other objective (housing, schools and so forth) gets pushed back. Israel has planning regulations that dictate the provision of at least one off-street parking spot for each new residential unit, while completely ignoring the size of the new unit and its location. On top of this policy directive, municipalities tend to provide free on-street parking at all times, leading many underground lots to be underused as people keep searching for free spots above ground. City requirements for off-street parking spaces jack up rents. They jack it up a lot at the bottom of the housing ladder. Proportionally speaking, the bigger the quota and the smaller the apartment, the larger the rent hike. For one-bedroom apartments with two parking places, as is required in places including Bothell and Federal Way, Washington, as much as one-third of the rent may actually pay for parking. A flotilla of studies supports that claim, and I’ll summarize them in this article, but first, a case study of residential real estate development may illuminate how critical parking is to the affordability of housing. While Tel Aviv may be a little bit behind regarding rational urban development it’s surprising that even urban role models such as Portland, Oregon have the same stupid rules. We can take some comfort in the fact that more people are aware that “free” parking is anything but free, and that parking is, in fact, not a public good. Even the city of Mumbai has finally started to charge a fee for on-street parking. Tel Aviv should learn the obvious lesson from this groundwater case and start focusing its planning priorities on those among us who really need central and affordable housing – humans.